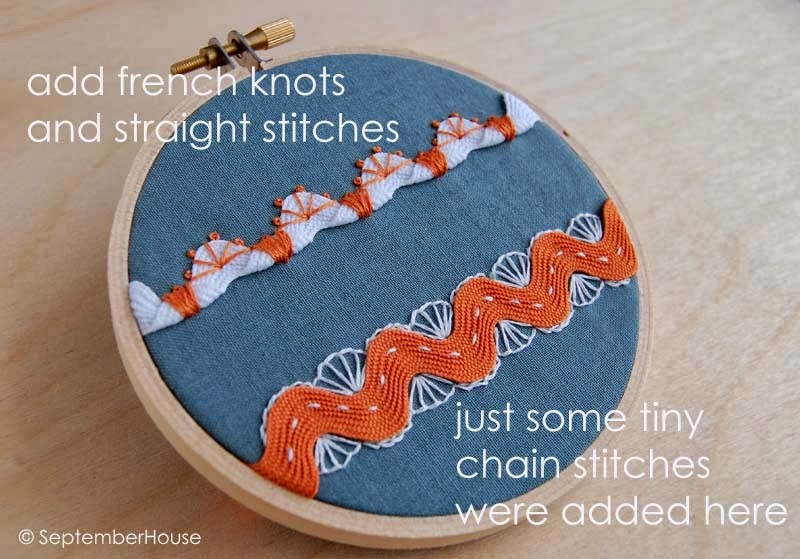 I'm back with another installment today - I hope you had a chance to take a peek at part one and perhaps even looked at your ribbon stash in a whole new light. 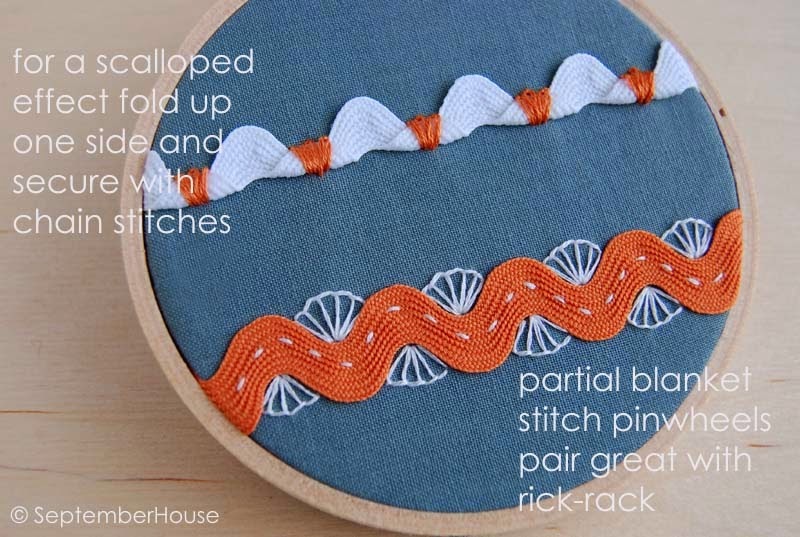 For part two I decided to play around with another favorite trim- rick rack! It's so tempting looking through the colors and sizes that are available. I just want to buy one of every kind. My local fabric stores carry a really nice selection but I am amazed at what else can be found online. 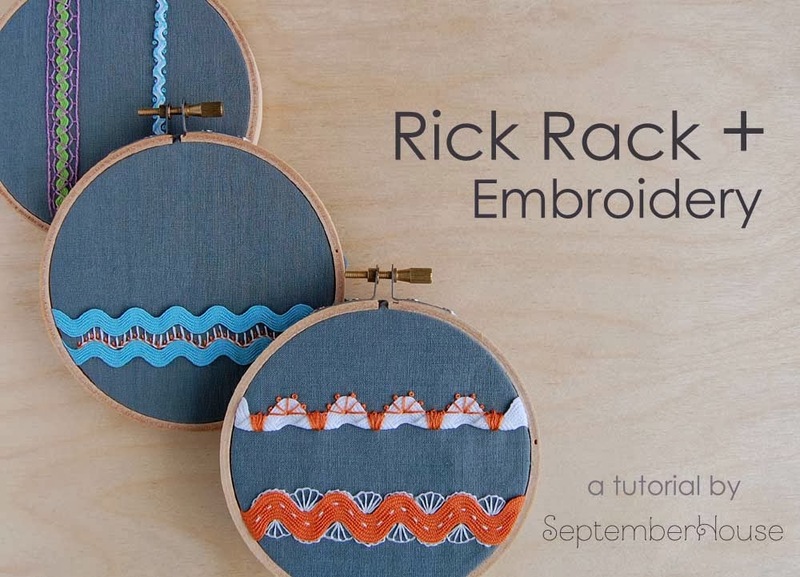 As a side note I have to add that I found that 'rick rack' was spelled different ways on different sites so I suggest typing it in different ways to see more results. I decided to go with how it is spelled on the Wrights brand packaging but I honestly do not know who is the authority on this matter. I started off stitching up not the rick rack itself but rather the space between two lengths of rick rack. I used a blanket stitch (although it was not easy maneuvering around those curves). It's not impossible though, I promise. Next I added a little punch of color with this bright orange. It's a subtle look but still unexpected and I like that about it. 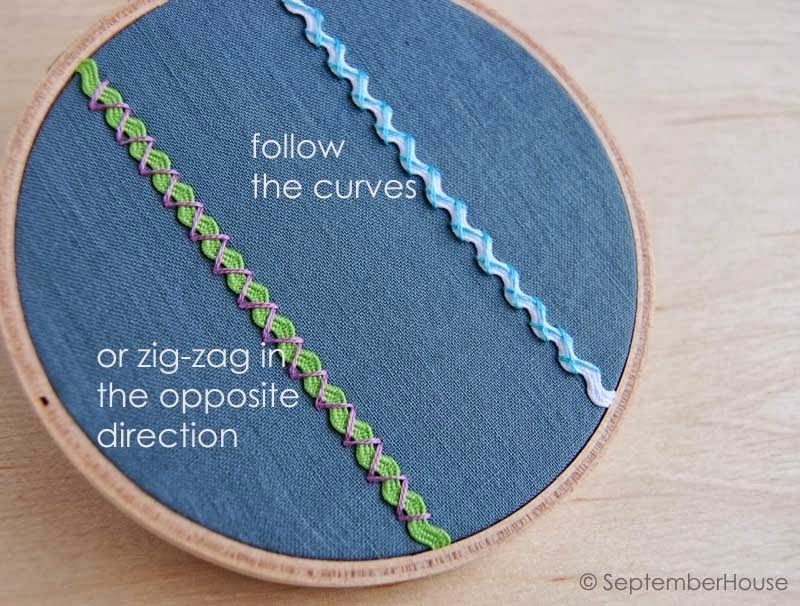 Rick Rack does not have to mean zig-zag. Just folding one side up or down gives you a whole new look. I used chain stitches to keep the folded rick rack in place here. On the bottom I used a running stitch right through the middle of my trim and then added some partial blanket stitch pinwheels - a stitch I am particularly fond of I might add. I was pretty happy with these as they were but wanted to at least see what else could be done. I added some French knots and straight stitches on the top and just some short lengths of chain stitch on the bottom. I think it added a slightly lacy look to this one and I like that. For my last examples I wanted to experiment with the thinnest of the rick racks. It turned out to be the trickiest of the bunch because I did not want the rick rack to get swallowed up by a lot of stitching. I tried to keep it pretty simple through the whole process and just used some straight stitches for the first part. On the white I just followed the line of the rick rack and used that as my guide. On the green though, I made my stitches cris-cross over the rick rack in the opposing direction. To add a little something extra to these I tucked in some French knots along the edges of the white rick rack. I am really loving the tidy look of that one! For the green I started with two rows of running stitch along the sides then decided to make it a whipped running stitch to give it a more solid look. Finally, I added some fly stitches to pull it all together. I admit to being a little on the fence about that one but I think if I had perhaps used some different colors I might like it more. I think this one would look good in a monochrome color scheme like the grosgrain example from part one. Oh well, the point is to experiment with these techniques and to have fun. There is no right or wrong here. 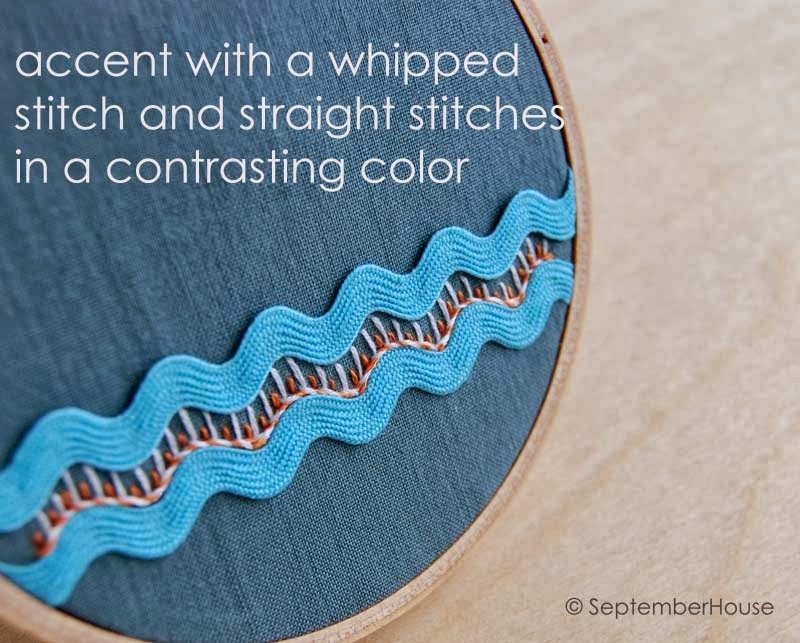 One more thing I have to add about these embroidery + trim inspirations - these can be a great way to just practice stitches or to learn new stitches. If you are like me, you sometimes want to embroider something but not neccesarily a pattern. 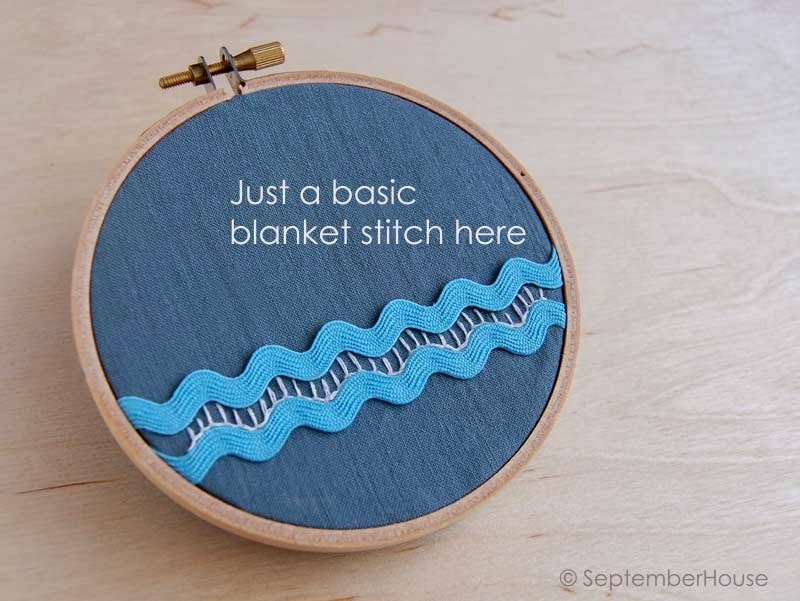 OR you might want to add some sort of accent to a fabric item but, without a pattern, you just are not sure what to stitch. Trying out these techniques could be just the ticket. 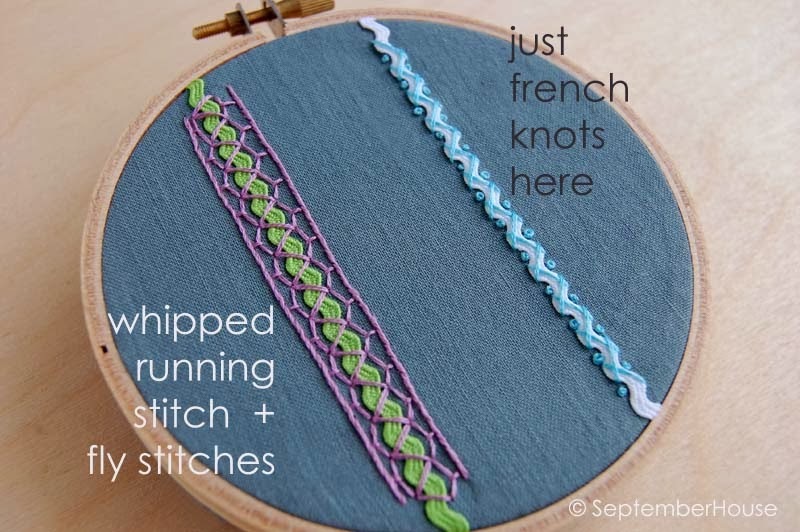 I am excited about trying these out on some new projects and I hope you are too!